First lady Michelle Obama, her teenage daughters Malia and Sasha and her mother, Marian Robinson, had tea with England's Prince Harry Tuesday morning as part of a weeklong European goodwill tour. 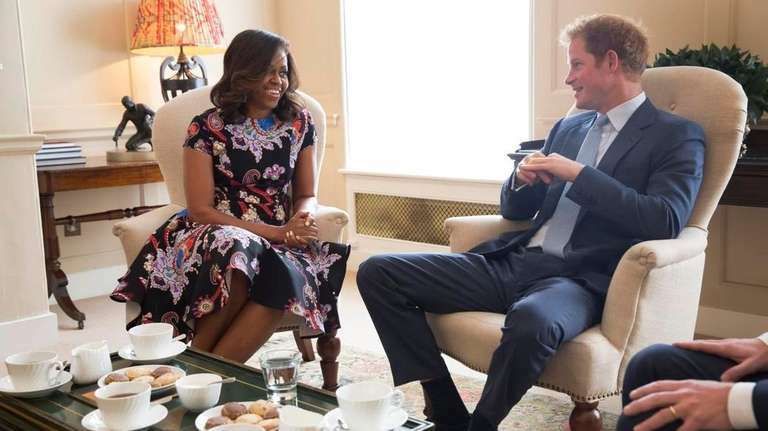 "Prince Harry was very pleased to host Mrs Michelle Obama for tea at Kensington Palace this morning," a representative for the royal residence tweeted. The two "discussed their shared interest in support for veterans and their families. Prince Harry was interested to hear from about the Let Girls Learn initiative to further adolescent girls' education around the world." The U.S. and British governments have teamed to support Let Girls Learn in the Democratic Republic of the Congo, Obama's office said. After tea, Obama, 51, visited the Mulberry School for Girls in London's low-income Tower Hamlets. The school's largely Bangladeshi Muslim girls -- three-quarters of whom qualify for free meals and most of whom do not speak English as a first language -- test higher than the national average, with 83 percent going to college, according to The Guardian.